Totally understandable. Most ancient religious rituals, even the ones we believe were instituted by God himself, we view as being a little bit weird in our day and age. Heck, even the Jews don’t do lamb sacrifices any more. An old friend of mine, a devout Christian, took his family of 12 to a Messianic Jewish church, which is a Christian church that practices at least some of the Law of the Old Testament or other Jewish customs. I had the privilege of participating in one of their family Seder Meals. My friend struggled to get me up to speed on what was going on but I did get that Jewish rituals are rich in symbolism and Messianic Jews are keen on understanding how symbols point to Jesus as being their Messiah rather than a future Messiah that Orthodox Jews are still waiting for. The reason I want to bring up the Jewish sacrifices is because I believe how the Jews viewed their lamb sacrifice is a good model for how we should view the sacrifice of Christ. It provides an alternative to the Penal Substitution Theory of Atonement which says that every human being must believe in the death and resurrection of Jesus in order to be forgiven of their sins. What Was the Cross For? Can a Mormon be saved? Can a Muslim be saved? Can a Jew be saved? What did Jesus accomplish on the Cross? And for whom did he accomplish it? Here’s how we picture salvation. If we were to draw a circle around who we think is going to go to heaven we tend to put ourselves within the circle (naturally), because we believe the sacrifice of Christ saves us, and we believe in that sacrifice. We put everyone else outside the circle of salvation because they do not believe in that sacrifice. I would like to offer a way in which we can view the sacrifice of Christ so that we can include some, or even many, non-Christians within the circle of salvation. There are other scriptures which seem to indicate only Christians are saved, things that Jesus said, but that will have to be addressed at another time. For now, let’s just focus on the Cross: what it did, how it saves people, and who can we include within that circle of salvation. Because we have narrowed salvation down to only believers in Christ in a post-Christ world we then must figure out a way in which God could have also saved people who existed prior to Christ. How was anyone saved in Old Testament days? The lamb sacrifices provide a ready answer it would seem. It seems reasonable to think that if a Jew had a lamb sacrificed for him then he was putting faith in his future Messiah to save him, albeit through a symbol that preceded the Messiah. The lamb “stood in” for the Messiah, who we now believe stood in for sinners to take a punishment for them because of their sins so they don’t have to take it themselves. A Jew prior to Christ could trust in God’s provision for him in the annual lamb sacrifice and that faith justified him. Since that symbol was supposed to point him to Christ, when Christ actually came the Jew who formerly got saved by obeying the Law of Sacrifices could now demonstrate his faith in God by having faith in Christ. His rejection of Christ would only indicate he was not the kind of person who ever had genuine faith in God, no matter how faithfully he followed the Law. Reject the Messiah, you’ve rejected God. Therefor your lamb sacrifices are null and void, not even worth an old rusty shekel. To hammer that message home to the Christ deniers, God sent the Romans to destroy the temple and the whole sacrificial system that went along with it in 70 A.D. This is fairly standard thinking in Evangelical Christianity, but instead of looking at the sacrifices the way a Jew would have looked at them at the time what we end up doing is taking our ideas about what we think Jesus accomplished on the Cross and read that back into what we think was accomplished for a Hebrew as he witnessed the annual Passover festival where a lamb was sacrificed. Still with me? Let me put it more simply: We think a Jew looked at the lamb sacrifice the way we look at the Lamb sacrifice. Let’s turn that around and look at the sacrifice of Christ the way a Jew looked at the lamb sacrifice. The short answer is: No, it didn’t. And more importantly, he didn’t think it did. That’s not why he went. Sacrifices are not offered today because there is no Temple and there hasn’t been one since 70 AD. Jews don’t believe they lost a means of salvation in 70 AD when the Temple was destroyed. Sacrifices were offered at the temple as a way of getting closer to God, not as a way to “get right” with God. Sacrifices served the same purposes as prayer today, including providing an avenue for praise and thanksgiving. Forgiveness was obtained through repentance, prayer and good deeds, with or without sacrifices. The purposes for bringing sacrifices were very similar to the purposes for prayer. It’s a devotional act, not a salvation ritual. In Judaism, sacrifice was never the exclusive means of obtaining forgiveness, was not in and of itself sufficient to obtain forgiveness, and in certain circumstances was not even effective to obtain forgiveness. I would like to add that the way in which a Jew obtained forgiveness through the sacrifices, to the degree that he did, was not by exercising his faith in God providing some animal to be punished in his stead. The way in which the sacrifice obtained forgiveness was by reminding the Jews that God is forgiving. This was to give him hope, to encourage him toward repentance. It was his repentance that saved the Jew, not the sacrifice. To summarize and to put it in terms us Christians might be able to relate to, it was all very devotional and relational toward God. It’s kind of like how us Charismatics like to worship: we like to involve our whole person, really get into it, and enjoy God in a way that mere ritual might not get us there. Do we sing songs of redemption to get redemption or because we are redeemed? Understood in this way I find it all very rich, especially compared to thinking of it as something to be performed in order to be forgiven of their sins. When a Jewish family packed their bags and piled into the family oxcart and set off for Jerusalem every year to participate in the sacrifices they weren’t thinking they were going off to “get their not-guilty verdict,” or “earn their way to heaven.” They were thinking of bringing themselves before God and being reminded once again that God is forgiving, and spending time enjoying that revelation apart from the demands of everyday life like trying to pay the bills and put food on the table. The purpose of the sacrifices was not to provide forgiveness, but to draw the Hebrews into a relationship with the God who is forgiving. The idea that sacrifices actually obtain for the participants their means of forgiveness is quite likely how the pagans viewed their sacrifices. They brought their sacrifices to their gods – including human sacrifice – to appease their angry gods. For them, it was about changing the minds of their capricious gods to save their own hides. It was not done in thanksgiving to gods who had already forgiven them. History has shown us that animal and human sacrifices existed among pagan societies, including the neighbors of the Israelites, long before the Law of Sacrifices was given by Moses. Atheists tell us that the Jews weren’t told by God to do sacrifices, they just copied their neighbors. They may have copied the form of the ritual, but the heart and the reasons behind it were transformed by the God of the Hebrews to something so much more beautiful and inspiring than what the pagans could ever imagine. I think that’s a better way to understand history, for those not hell-bent on removing God from history, to say that God did indeed copy the practice of animal sacrifices from the Hebrews’ pagan neighbors but he didn’t copy the purpose for those sacrifices. He raised the reason for doing them to a whole new level of devotion to God. It wasn’t done for the sake of persuading capricious gods to go easy on them, but to honor a loving God who compassionately reached out to humans so they would be able to understand and enjoy that revelation. When the prophet Jonah was called on by God to go to his pagan neighbors in Nineveh, Jonah didn’t want to go because he didn’t want God to be gracious to his people’s enemies. Jonah hated the Ninevites and would rather see God judge them for their wickedness. Jonah said to God, “I knew that you are a gracious and compassionate God, slow to anger and abounding in love, a God who relents from sending calamity.” (4:2) How did he know that? Because he had been participating in the annual Jewish sacrifices all his life. Did Jonah go to Nineveh and teach them to follow the Law of Moses in order to be spared from judgement? No, he never said a word about lamb sacrifices. He just told them to stop doing their wicked deeds and the God of the Hebrews would spare them. They got saved without performing the Jewish sacrifices. God is gracious and forgives. That’s all that mattered. The goat was then handed over to a “fit man” who drove him into the wilderness and over a cliff to fall to his death. What this means to Christians has morphed over the centuries to where the goat symbolizes the future Messiah, laying hands on him symbolized a transfer of sins from the people to the goat, and the goat being driven over the cliff meant he took the punishment of sin on behalf of the people so the people wouldn’t have to take it themselves. Penal Substitution Atonement, in other words. Again, that’s not how the Jews understood it. Not only does this understanding give a false idea of the salvation we receive in Christ but it robs us of a deep and beautiful revelation. Atonement means many things, but it’s never a unilateral action on the part of the people. It’s always done in a cooperative covenant between God and man. With the goat, atonement means cleansing: “On this day atonement will be made for you, to cleanse you. Then, before the Lord, you will be clean from all your sins.” (Lev. 16:30) It wasn’t the High Priest’s act that cleansed the Jew. If any particular Jew attending the Yom Kippur festival was determined to continue to live in sin then nothing was accomplished. The ritual was symbolic of what was supposed to be taking place in the heart of the penitent. The Hebrew could believe in what he was seeing all he wanted but if he wasn’t willing to repent he left the festival the same as when he arrived: dead in his sin. The ritual of the two goats symbolizes both God and man working together for salvation. The goat didn’t just wander off on his own; he was handed over to a shepherd who didn’t just passively stand by waiting for the goat to make his move. He took sticks and beat the poor beast, driving him into the wilderness. He zealously drove him away the way God zealously drives sin out of our lives. 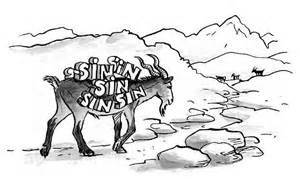 The message of the scapegoat isn’t that our sins are transferred to another who then takes a beating in our stead. The message is this: God actively pursues us and drives our sin out of us. It is a picture of a life-long covenant relationship with God, not an annual rite of forgiveness to be replaced by a Messiah as a one-time rite of forgiveness. The reason we are represented by a goat is because we are stubborn, just like a goat. Gentle prodding doesn’t always get us moving. Sometimes God has to take a six foot two by four and whack us in the behind with it to get us stubborn old goats moving. God has an uncanny ability to get us to cooperate with Him in our salvation. The scapegoat is not a picture of a just God removing sin out of his view so he can avoid having to administer justice to us because of that sin. How can it be? God is omniscient. He’s always going to see our sin. The scapegoat is a picture of a loving God removing sin out of our lives so we don’t have to suffer the consequences of our own sin. It’s a picture of a God zealous to restore wholeness to his people. The Jews didn’t go to Jerusalem every year to be forgiven. They went to be reminded that God is forgiving, by nature. That understanding encouraged them to bring themselves and their wickedness before their God, then make a dedication to turn from their wickedness, and once having done that to rejoice in that forgiveness. Or, if they haven’t been wicked, they come to rejoice in the knowledge that their God is a forgiving God eager to enter into relationship to save man from all of his sin, whether benign or malignant. In our modern vernacular a scapegoat has come to mean someone we blame for our troubles, but this is one hundred and eighty degrees opposite to the purpose of the scapegoat to ancient Hebrews. Rather than blaming someone else for the trouble our sins cause us the message of the scapegoat was that we take full responsibility for our sins and do what we can to be cleansed from sin. That doesn’t mean to just stop sinning, but seeking a change of character so that we won’t even want to or be inclined to sin, as much as possible. The lamb sacrifice and the scapegoat saved the Jew not because God pronounced him legally “saved” because of his attendance at Yom Kippur and faith in God, but because he entered into relationship with God to rid his life of sin and be restored to wholeness. What Jesus accomplished on the Cross was to provide another avenue for restoration, by means of faith, that extended well beyond the borders of Israel. In the Old Covenant Jews came to Jerusalem once a year to be drawn by God. In the New Covenant Jesus said, “If I be lifted up I will draw all men unto myself,” and by “all men” he meant all humans on the planet from that point on. Through Jesus, God has “opened the door of faith unto the Gentiles,” (Acts 14:27) “purifying their hearts by faith,” (Acts 15:9), giving them “access by faith into this grace,” (Rom. 5:2) and the Holy Spirit because of this faith. (Gal. 3:2) For many this begins with their own “observance” of the Lamb Sacrifice which draws them into being a good person which brings them eternal salvation. This is a follow-on article to Salvation by Being Good.